Writing, the subject of much innovative scholarship in recent years, is only half of what we call literacy. The other half, reading, now finally receives its due in these groundbreaking essays by a distinguished group of anthropologists and literary scholars. The essays move well beyond the simple rubric of "literacy" in its traditional sense of evolutionary advancement from oral to written communication. Some investigate reading in exotically cross-cultural contexts. Some analyze the long historical transformation of reading in the West from a collective, oral practice to the private, silent one it is today, while others demonstrate that in certain Western contexts reading is still very much a social activity. 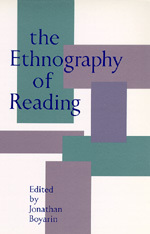 The reading situations described here range from Anglo-Saxon England to contemporary Indonesia, from ancient Israel to a Kashaya Pomo Indian reservation. Filled with insights that erase the line between orality and textuality, this collection will attract a broad readership in anthropology, literature, history, and philosophy, as well as in religious, gender, and cultural studies. Jonathan Boyarin is Visiting Scholar at the Center for Studies of Social Change, New School for Social Research. He is the author of Storm from Paradise: The Politics of Jewish Memory (1992).